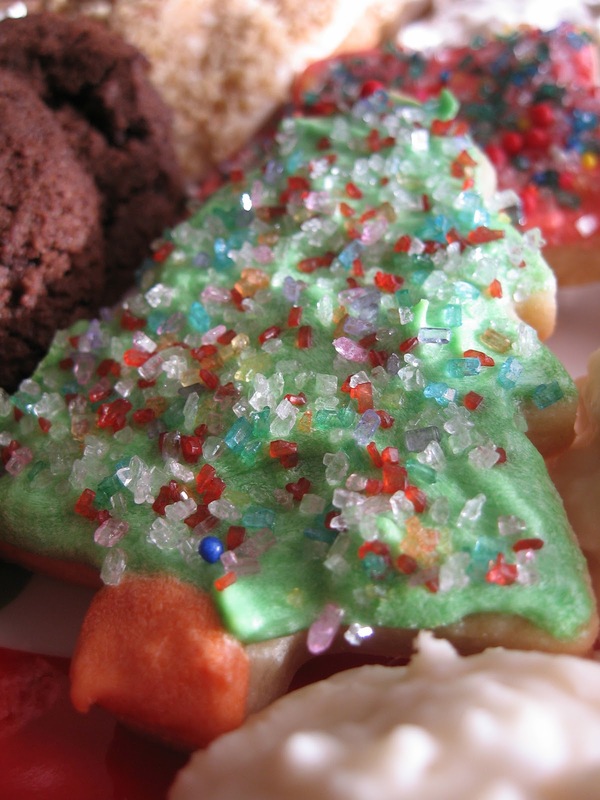 FOOD SNOB: Christmas = cookies! Christmas definitely equals cookies at my house. After nearly 5 pounds of flour, three pounds of butter, assorted other ingredients, and 11 1/2 hours of my time yesterday, I have nine varieties of Christmas cookies on hand! I always enjoy my baking day; afterwards I enjoy eating and sharing homemade cookies over the following weeks. 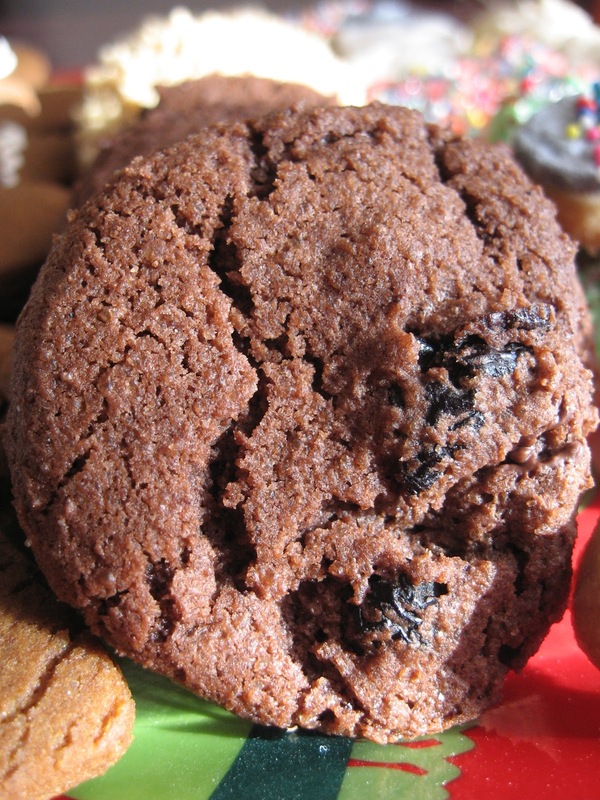 A soft, chewy, yet sturdy molasses cookie, with a double punch from ground and candied ginger. I like that these cookies focus only on the ginger, omitting the more traditional spices found in molasses cookies. However, I'm sure they'd be delicious with the addition of cinnamon, nutmeg, and cloves, too! If you are careful to catch these beauties just as they approach done, you will be rewarded with the richest, fudgiest brownie ever! I enjoy the white chocolate and crushed peppermint candy topping -- my mom makes "peppermint bark" (white chocolate and crushed candy canes) yearly, but I've found it's too sweet for me in my "old age." These brownies offer a taste of that childhood candy, but in a more balanced package. Plus, chocolate and peppermint is such a classic holiday flavor, and the candy canes add a pop of color to the cookie tray. Win-win-win! After trying these bars for the first time last year, I received complimentary phone calls and emails from several choir colleagues about these! Better make 'em a frequent repeat. These remind me somewhat of a lemon bar, as they have a shortbread crust covered in an eggy, fruity topping. However, these bars have more texture than a lemon bar, filled with chewy dried apricots and plenty of flake coconut. (I choose to use unsweetened coconut, which is a variation from the recipe. I find it makes the bars just a little less sweet, with more coconut flavor.) Side note: John doesn't care much for coconut, but he still loves these! Bless the Post-Punk Kitchen for developing the simplest, easiest to work with recipe for gingerbread vegans! I love so much about this recipe -- the yield is small to moderate, (important when you are making a plethora of cookies as I do,) it calls for basic pantry staples (canola oil! Woot! ), results in a soft, yet sturdy cookie, and is so deeply SPICY. The bestest. I wasn't entirely sure these cookies were a success straight out of the oven, (they seemed a bit dry to me at first,) but once they cooled . . . watch out! Chocolatey, rich, and decadent, with a nice sour pop of dried cherry every now and then. These may be a frequent repeat for years to come! John labeled these as one of his favorites of this year's selection, and I agree -- the soft, buttery, fluffy cookie topped with crunchy, sweet-sour glaze is practically perfect. :) I enjoy the bumpy, rustic look my cookie scoop gave these cookies, too! More little pockets for glaze to soak in, right? A classic I almost considered skipping these this year, but I'm so thankful I didn't. Real Simple creates amazing recipes, and this sugar cookie dough is no exception. Simple, classic, tasty, and easy to work with, this dough has booted my GRANDMA'S recipe for sugar cookies out of my holiday cookie rotation. :) Can you believe it? If left relatively thick, the cookies bake up soft yet sturdy, with rich vanilla flavor that is only complemented by a bit of frosting and sprinkles. You want a decorated sugar cookie base to have some flavor, but not be overwhelming, you know? I've been delighted with this recipe, and again, appreciate the moderate yield. With my baking done, I'm ready to kick back, relax, and enjoy the rest of my Christmas vacation! What did you bake this year? Do you focus more on family favorites, or exploring new recipes? Great job on your pretty cookie tray! What a great gift! I don't do any Christmas baking (other than helping my Grandpa make Rosettes and Fattigmand) because if that stuff is in my house, I'd eat it all! Hooray for cookies! I only made my standards--swedish farmer cookies and almond poppyseed--but then we flew out to stay with family, where there was a veritable mountain of other cookies. All cookies all the time!